You’ll recall that recently Pod2g proclaimed to have a working Untethered Jailbreak for iOS 6 on his iPhone 5, but it wasn’t quite ready for the public domain, and would probably be held back until after the upcoming iOS 6.1 update. 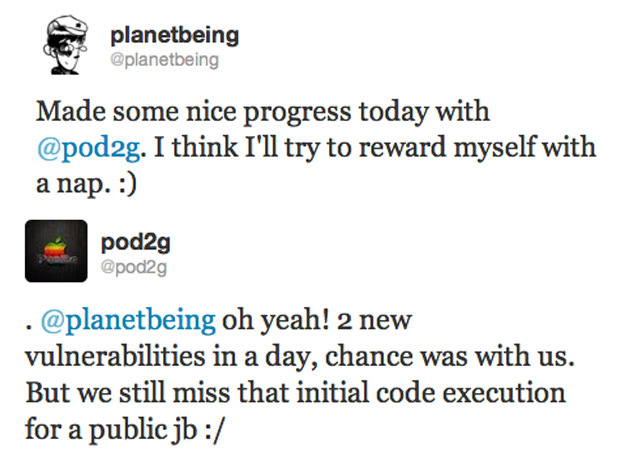 Pod2g and Planetbeing exchanged some tweets today revealing details that those last few bits needed to get a stable Untethered Jailbreak is progressing nicely. It seems that they’ve also managed to find two new vulnerabilities in a single day. It appears the situation for the Apple TV 3 community remains bleak to say the least, with what seems nobody working on a solution and prices being forced up for the Apple TV 2 around the web because of this. Whilst the iOS 6 Jailbreak is progressing, it is worth noting that the final bits needed to make it a public release aren’t quite ready. We’ll keep our fingers crossed that the final few pieces to make a public Untethered iOS 6 Jailbreak come around quickly and we finally see a release of not only an iPhone 5 Jailbreak, but an iOS 6 Untethered Jailbreak.